I'm new to GCFScape and VTFEdit. My issue is I can not seem to find any folder that has skins downloaded from the server I play on. I am not an admin or administrator on the server just a frequent player. I want to see how they made them and want to learn on how to customize myself. Thanks for your time, I appreciate it. I would not recommend doing this as many items used can be community locked so that the servers cannot be replicated elsewhere. I would look into mods on this website as means for this. If you want to mess with the custom stuff textures,you check the folder MATERIALS. 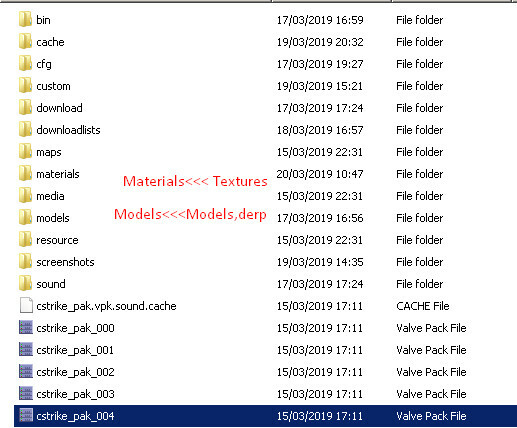 Or if you want to mess with the custom stuff models,you check the folder MODELS. Although if you want to open the textures,you gotta download a program called VTFEdit,obviously. Gcfscape mostly only opens VPKS,Valve Package Files. And that means that is only Default Stuff from the game,not custom stuff are there. I found that information via google. I have looked through every folder on my pc, every folder using GCFSCape and every folder using the VTFEditor. I can not find a folder that has the skins from the server I play on. Find what I needed now I just need to learn to decompile models.